Need Some Mommy “Me” Time? 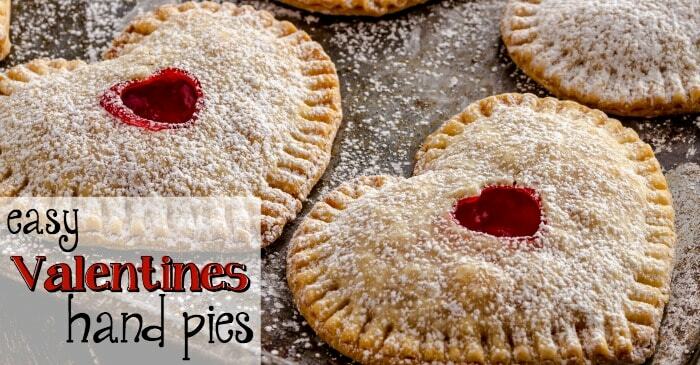 As I’m sitting here writing this, I am busy stuffing my face with these awesomely Easy Valentines Hand Pies. My excuse: I’m hungry and they’re yummy I need to find a recipe to make for the kids’ Valentines parties this year. I know I’m getting started a bit early (probably an understatement since it’s early January) but I’m hungry and they’re yummy I always get in a bind right before the party and then there’s this whole thing. I have promised myself that THIS party I will not do that to myself…right. It’s just that I’m hungry and they’re yummy I feel like if I don’t get very happy with the recipe first, then, I’ll be super disappointed in it on the day of and end up just grabbing a box of cookies on the way to the party. Which has actually happened to me before. Besides, I’m hungry and they’re yummy. I am ALLOWED to have a hand pie of my very own before the kids come home from school (or for lunch, like right now). This IS the first day they’re back in class, after all. It is the end of the holiday and I CAN USE ANY EXCUSE I WANT TO HAVE MY OWN YUMMY DESSERT FOR LUNCH. Sorry, I just needed a little affirmation there. Heh. So, since these are so very ridiculously easy, feel free to pop into your own kitchen and make some to have for your own lunch, snack, dinner or dessert. I mean, they’ve got fruit in them–it’s like a peanut butter and jelly sandwich without the peanut butter, so it MUST be healthy, right? Right. I’ll just be over here in the corner, eating my hand pies and telling myself these little white lies (because I’m hungry and they’re yummy I have to eat SOMETHING for lunch today). 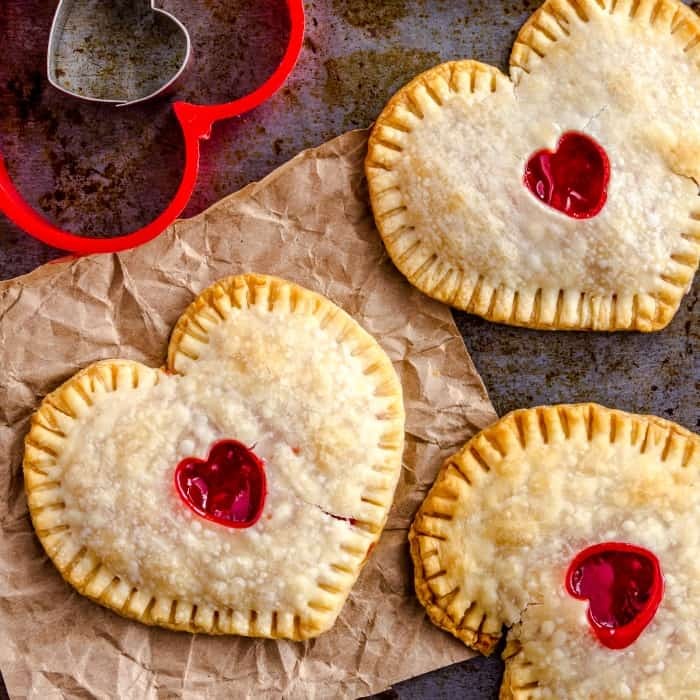 As I'm sitting here writing this, I am busy stuffing my face with these awesomely Easy Valentines Hand Pies. My excuse: I'm hungry and they're yummy. Preheat the oven to 400-degrees. Using a rolling pin, flatten your bread slices individually. 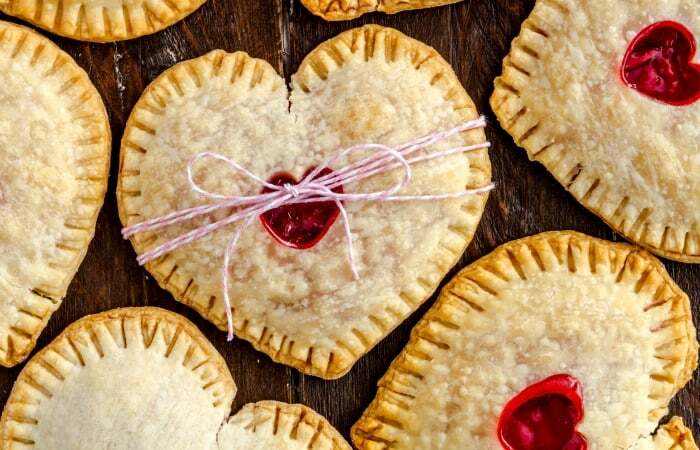 Using a large heat-shaped cookie cutter, cut all of the bread slices into hearts. Place 2 tblspn of pie filling in the center of half of the hearts. 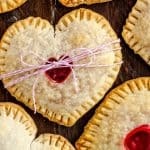 On the other half of the hearts, cut out a tiny heart from the center using your smallest heart cookie cutter. Lay these with the tiny cut out on top of those filled with preserves. Using a fork, crimp 1/4-inch around the edge. Spread 1/2 tblspn of the coconut oil over the top of each folded pocket. Sprinkle the top of each folded pocket with a light dusting of sugar. Place pockets in the oven on a cookie sheet and bake for 10-12 minutes or until toasted. Don’t forget to tell me how your’s turn out…I love these so much and I think I might just have to go finish-off the two that I made for the kids’ snack…no judging. Heh.